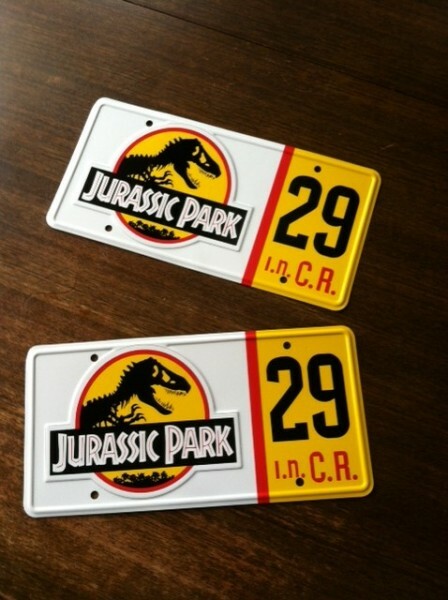 Celebrity Machines makes Jurassic Park Plates, in #12, #18, and blank. Since I am doing #29 I had to order the blanks. I received mine a few weeks ago, but I was waiting to be sure my “vanity” plate from the state was approved. I got the letter yesterday that JP 29 is now my license plate, so I went ahead and finished off the blank celebrity plates with #29. If you order blank plates from Celebrity Machines, tell him what number you want and he will include the 3m numbers you will need. The numbers are 3″ tall by 1 1/4″ wide. The yellow section is 3 1/4″ wide(from red strip to emboss). So 2 1/2″ for numbers and 3/4″ for free space, and you get 1/4″ free space on each side and inbetween the numbers. For height placement, with the screw hole it seemed better to have more “gutter” at the top the above the lettering i.n. C.R. (Isla Nublar/ Costa Rica). It ended up about 3/4″ at top and 3/8″ at the bottom. They look great, now I just need to wait for my state plates to get made. Nice! I’d been holding off buying my set until I got around to finding out what CM’s quality was like. Making my purchase tonight. We all have Celebrity Machine’s license plates on our Jeeps. They are the very best you can buy! Without a doubt. Mine came in today. Wow. About to apply the stickers. Brian, thanks for the placement measurements! You’re welcome! By the way if you are using a 1 as one of your digits on a custom plate, you will probably want to figure out different spacing, as the 1 is narrower than all the other numbers.